The Livermorium Slider Keyboard Moto Mod turns any Moto Mod-compatible phone into a modern reincarnation of the HTC Tilt (a phone that I once personally owned!) and will soon be available for $99. 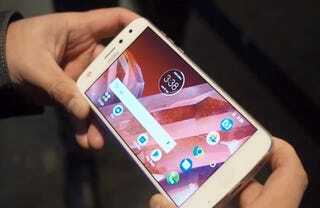 Motorola’s Z series of phones have a connector on the back that allows you to attach Moto Mods add-on modules like a big battery, a speaker, a projector, and a fancier camera, and a totally worthless DirecTV thingie. Motorola has been working with third-party companies to develop new Moto Mods, and this keyboard is one of the results of that program. Aside from the added thickness, the one downside I notice off the bat is that with the keyboard mod attached to the back of the phone, you have to slide the keyboard open in order to use the camera.